A number of prayers can be found in this article that can be used along side the five decades rosary, the 3×3 chaplet and the rosary of sorrow. Each iteration of the rosary bead can be used for several different prayers and prayer types. In this article we will be listing a few of these different types of prayers, along with their applicable rosary. We will also be providing helpful links to the individual prayers used for the rosary and types of devotion. 1.1 What is the Five Decade Rosary? 3.1 What is the Nine Bead Chaplet? What is the Five Decade Rosary? The most common and well known rosary bead that can be used for a variety of prayers. They are laid out with a cross or a crucifix and 3 x “Hail Mary” beads set between 2 x “Our Father” beads, and leads into the rosary center. The chain has 50 x “Hail Mary” beads that are separated into groups of 10 by 1 x “Our Father” bead, and loops back onto the rosary center. 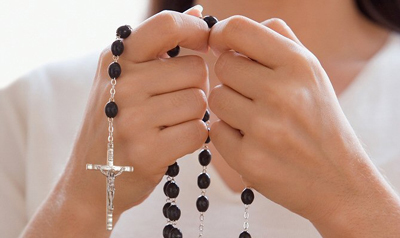 For a detailed explanation on how to use a rosary, see our article on Rosary Beads. “Glory be to the Father, to the Son, and to the Holy Spirit, as it was, is now, and ever shall be, world without end. 1 x Our Father, while contemplating that days Mystery. “O God, whose only begotten Son, by His life, death, and resurrection, has purchased for us the rewards of eternal life, grant, we beseech Thee, that meditating upon these mysteries of the Most Holy Rosary of the Blessed Virgin Mary, we may imitate what they contain and obtain what they promise, through the same Christ Our Lord. For more information on the use of this prayer, see our article on the prayer of St. Gertrude. “Eternal Father, I offer Thee the Most Precious Blood of Thy Divine Son, Jesus, in union with the masses said throughout the world today, for all the holy souls in purgatory*, for sinners everywhere, for sinners in the universal church, those in my own home and within my family. Repeat these prayers until the rosary center is reached. “You expired, Jesus, but the source of life gushed forth for souls, and the ocean of mercy opened up for the whole world. O Fount of Life, unfathomable Divine Mercy, envelop the whole world and empty Yourself out upon us. “Holy God, Holy Mighty One, Holy Immortal One, have mercy on us and on the whole world. Eternal God, in whom mercy is endless and the treasury of compassion inexhaustible, look kindly upon us, and increase Your mercy in us, that in difficult moments, we might not despair nor become despondent, but with great confidence, submit ourselves to Your holy will, which is Love and Mercy itself. These rosary beads have 7 decades with one “Our Father” bead, and 7 “Hail Mary” beads. Another difference between these rosary beads and the five decade rosary is with the lead in beads. The cross is sometimes replaced with a medallion depicting the Virgin Mary and there is only one “Our Father” bead instead of the normal two. When using the rosary of the seven sorrows, we are reflecting on the mysteries of Mary’s life and not Jesus’. We also address these mysteries directly with each of the “Our Father” beads having an accompanying prayer. “In the Name of the Father, and of the Son and of the Holy Spirit. My God, I offer You this Rosary for Your glory, so I can honor your Holy Mother, the Blessed Virgin, so I can share and meditate upon her suffering. I humbly beg you to give me true repentance for all my sins. Give me wisdom and humility, so that I may receive all the indulgences contained in this prayer. O my God, I am heartily sorry for having offended You, and I detest all my sins because I dread the loss of Heaven and the pains of hell; but most of all because they offend You, my God, You Who are all good and deserving of all my love. I firmly resolve, with the help of Your grace, to confess my sins, to do penance, and to amend my life. Repeat for each of the following mysteries. Beloved Mother Mary, whose Heart suffered beyond bearing because of us, teach us to suffer with you and with love, and to accept all the suffering God deems it necessary to send our way. Let us suffer, and may our suffering be known to God only, like yours and that of Jesus. Do not let us show our suffering to the world, so it will matter more and be used to atone for the sins of the world. You, Mother, who suffered with the Savior of the world, we offer you our suffering, and the suffering of the world, because we are your children. Join those sorrows to your own and to those of the Lord Jesus Christ, then offer them to God the Father. You are a Mother greater than all. Beloved Mother, who has suffered so much, give to us your courageous heart. Please pray for us to have strength so that we can be brave like you and accept with love the suffering God sends our way. Help us to also accept all the suffering we inflict upon ourselves and the suffering inflicted upon us by others. Heavenly Mother, you, in union with Jesus, purify our suffering so that we may give glory to God and save our souls. Beloved Mother, teach us to accept all our sufferings because of our sins and to atone for the sins of the whole world. Beloved Mother, so stricken with grief, help us to bear our own suffering with courage and love so that we may relieve your Sorrowful Heart and that of Jesus. In doing so, may we give glory to God Who gave you and Jesus to humanity. As you suffered, teach us to suffer silently and patiently. Grant unto us the grace of loving God in everything. O Mother of Sorrows, most afflicted of all mothers, have mercy on the sinners of the whole world. Beloved Mother, Queen of the Martyrs, give us the courage you had in all your sufferings so that we may unite our sufferings with yours and give glory to God. Help us follow all His commandments and those of the Church so that Our Lord’s sacrifice will not be in vain, and all sinners in the world will be saved. We thank you, Beloved Mother, for your courage as you stood beneath your dying Child to comfort Him on the Cross. As our Savior drew His last breath, you became a wonderful Mother to all of us; you became the Blessed Mother of the world. We know that you love us more than our own earthly parents do. We implore you to be our advocate before the Throne of Mercy and Grace so that we can truly become your children. We thank you for Jesus, our Savior and Redeemer, and we thank Jesus for giving you to us. Please pray for us, Mother. Most Beloved Mother, whose beauty surpasses that of all mothers, Mother of Mercy, Mother of Jesus, and Mother to us all, we are your children and we place all our trust in you. Teach us to see God in all things and all situations, even our sufferings. Help us to understand the importance of suffering, and also to know the purpose of our suffering as God had intended it. You yourself were conceived and born without sin, were preserved from sin, yet you suffered more than anybody else. You accepted suffering and pain with love and with unsurpassed courage. You stood by your Son from the time He was arrested until He died. You suffered along with Him, felt His every pain and torment. You accomplished the Will of God the Father; and according to His will, you have become our Mother. We beg you, dear Mother, to teach us to do as Jesus did. Teach us to accept our cross courageously. We trust you, most Merciful Mother, so teach us to sacrifice for all the sinners in the world. Help us to follow in your Son’s footsteps, and even to be willing to lay down our lives for others. Queen of Martyrs, your heart suffered so much. I beg you, by the merits of the tears you shed in these terrible and sorrowful times, to obtain for me and all the sinners of the world the grace of complete sincerity and repentance. Mary, who was conceived without sin and who suffered for us, pray for us. What is the Nine Bead Chaplet? These small chaplets are available in two different layouts. Both have a cross and a medallion at either end. The difference is with the layout of the beads. Both have a total of nine beads, but where one type has all nine in one group, the other the has three groups of three beads. When praying to saints, there are chaplets that are purposely made for their prayer. These chaplets are easily identified as the medallion would be pacific for that saint. with the Elect throughout Eternity. in all the tabernacles until the end of time. Saint Jude pray for us and hear our prayers. that you are my mother and protector. who can withstand you grace. to obtain assistance in this life.